If you’re looking for work in the film industry, then Chicago is the place to be. The long list of film production in Chicago continues to grow according to the Department of Commerce and Economic Opportunity. TV series “Chicago Fire”, “Empire”, and “Shameless” were just some of the series to have shot and filmed in Chicago. Even feature film “Batman v. Superman: Dawn of Justice” filmed scenes in the Windy City. According to an article from DNAInfo, “Chicago is looking more and more like Hollywood.” If you take a look at the map below you will realize that assessment is not far off. 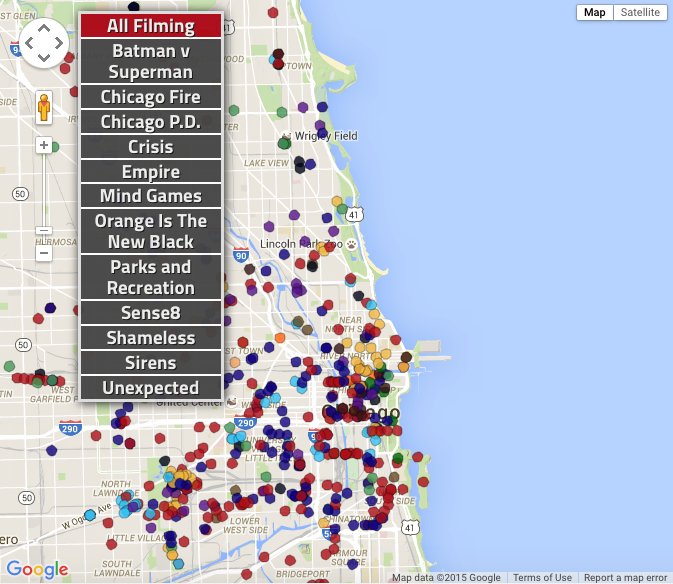 Each dot within the map below represents where film companies shot scenes for both television shows and feature films in Chicago. The full interactive map can be found in the article here. Also, it’s important to note that the unemployment rate for arts and media occupations comes in at a 4.7, which is below the national average set at 5.2. It has become clear that if you are looking for work within in the film industry, Chicago is an obvious destination.